LOS ANGELES – Two Lancaster Sheriff’s Station deputies were recognized Wednesday by the Los Angeles County Board of Supervisors for saving a child and father from a burning building in September. Deputies Samuel Goldstein and Tanner Harris were honored for the heroic actions they took on Sept. 19 when responding to a call for service at a burning apartment complex near 16th Street West and Avenue K-8 in Lancaster. The deputies arrived to find several apartments fully engulfed in flames as firefighters worked to extinguish the blaze. Even though residents assured the deputies that everyone was out of the building, one closed door upstairs caught Deputy Goldstein’s eye and both deputies ran up to knock on it. Noticing the door was locked, Deputy Harris kicked the door, allowing Deputy Goldstein to run in. Inside the smoky apartment, he found a confused Jason Williams, clearly having just woken up from a nap. Deputy Goldstein ran to a rear bedroom and found 1-year-old Charlie asleep in a bed. Deputies Tanner and Goldstein were able to run out of the burning building with both father and son. 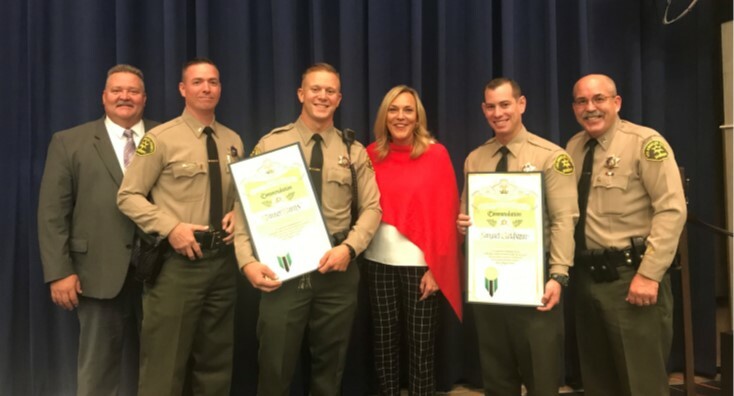 Los Angeles County Supervisor Kathryn Barger honored both deputies on Wednesday, Nov. 7, at a Supervisors meeting held at the Hall of Administration in Los Angeles. “We are so grateful for everything that our local Los Angeles County Sheriff’s deputies do to keep us safe each and every day,” Barger said. Both deputies expressed gratitude to Supervisor Barger and said they were humbled by the recognition. “We are a team. We did what any other deputy would have done,” Deputy Goldstein said. “This is a good day for all of law enforcement,” Deputy Harris added. 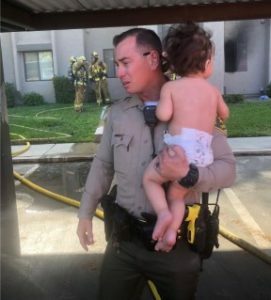 1 comment for "Lancaster deputies honored for saving baby, father from burning building"